The Evening Standard, usually a reliable cheerleader of the Battersea Power Station redevelopment, reports that the already limited affordable housing commitment is being slashed in half. The argument appears to be that as the bottom is falling out of the luxury homes market because of entirely predictable problems of over supply, the developers can no longer afford to build the sort of homes that people actually need. The commitment had originally stood at more than 600. By the time I wrote Up In Smoke, my book about the history of Battersea Power Station, this had been reduced to 565 units – around 15 per cent of the total number of new flats. Some of these have since been moved to another location – ie, nowhere near the posh flats going up round the power station itself. The Standard says the developers now want to build only 386 affordable homes – around 9 per cent of the final residential offering. That’s because following escalating costs caused by Brexit, they need to focus their finance on renovating the power station itself and building the new Northern Line extension. It’s the sort of trick used by developers all around the country as they attempt to weasel their way out of already meagre commitments, and at Battersea they can do this without making a new planning application or holding a public consultation by using a “deed of variation”. Conservative Wandsworth Council, whose commitment to a developer-led solution to the power station has been steadfast despite three decades of excruciating and occasional hilarious disappointment, are unlikely to object. Ah, the irony. When I interviewed the amiable Rob Tincknell, the development’s chief executive, in 2014, he boasted it was only the developer’s commitment to the Northern Line extension (NLE) that was allowing the already limited amount of affordable housing to be built in the first place. Without the NLE, he insisted, they would never be able to build this number of affordable units. Now the argument is reversed. Because they have to build the NLE, they can’t afford to build as much affordable housing. It’s a classic piece of power station sophistry to match that of the recent decision to transform some planned residential units into commercial, despite earlier assurances that they having developed the perfect ingredients for a mixed use scheme they’d be fools to change their minds. Tincknell told me in 2014 via email: “BPS makes its section 106 planning contributions in two ways. The first is a ￡200m plus contribution to the Northern Line extension (NLE), the second is 15% affordable housing or 565 units – the largest amount ever built in Central London. Suddenly, all that has changed. The developers claim they hope to restore the missing 250 units at the end of the build. While writing my forthcoming book about Battersea Power Station, I often wondered why nobody had done so before. The reason, I decided, was that as the various redevelopment projects were never completed, it was a very difficult tale to bring to a close. However, with the latest scheme being backed by serious money and as the buildings around the power station started to rise, it seemed as if the end was finally in sight. Today a report in City AM confirming what many have been saying for months – that the heat is coming out of the Nine Elms luxury property market, forcing developers to slash prices in a bid to retain the overseas investors on which so many hopes are pinned. I was told a couple of times that this might happen, most notably when the chief executive of one previous development pointed out that the intensity of development on the Battersea site – not to mention elsewhere in the Nine Elms area, where thousands of similar flats are being built – meant that the Malaysian developers would be effectively competing against themselves on price. Unless it was managed carefully, and if the market ever dipped, there could be problems. While those Londoners who decry the over-development of the power station may be excused at being amused by the problems being experienced by the developers, this is bad news for the building itself which is still far from secure: a hollow, roofless shell that is currently lacking three chimneys. Wandsworth, who have presided over one of the most disastrous redevelopment projects in London for more than 30 years, had allowed the developers to build so many flats in advance of restoration so the developers could flog them to raise capital to pay to fix the power station. If those flats don’t sell, there is a danger that the power station will be left in a worse state than ever. In these circumstances, demolition would be a serious possibility. While we should be concerned, I don’t think it’s quite time to panic. The appeal of the Malaysian developers is that they are effectively being bankrolled by the Malaysian state in the shape of the country’s pension fund, which should mean pockets are deep enough to sustain these fluctuations in the property market. 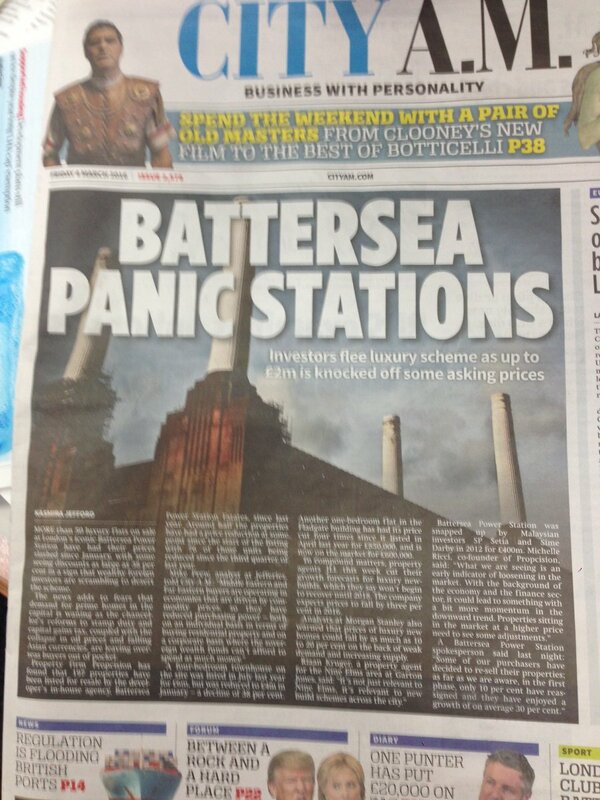 But it does show that nothing is certain when it comes to the story of Battersea Power Station, except uncertainty. This is a rewritten version of a piece I wrote on London’s homeless tours in 2011. No amount of playful London nerdery can prepare you for the emotional thump that is an Unseen Tour. These walks are organised by Sock Mob, an informal group of volunteers who work with London’s homeless – and it’s the homeless, or former homeless, who take you on the tour. In their company, you’ll learn things about London you probably didn’t know, like where to find the Second World War shrapnel on the side of St Clement’s Dane church on the Strand, and you’ll learn things you definitely didn’t know, like which Covent Garden cafe gives food on credit to the homeless when they are short of cash. We meet at Temple, that aged hive of streets dominated by the vast grey Victorian Gothic splendour of the Royal Courts of Justice. Mark and Viv, the tour guides, have spent long periods sleeping rough and few people can have as strong a relationship with the streets of London as those who used to sleep on them. The next hour-and-a-half is a powerful mix of autobiography and ancient history. One minute Viv is talking about the Knights Templers, who lent their name to the area after building a circular stone church here in 1185, the next she’s telling you about the night she got chased from her ‘bash’ (a makeshift shelter constructed every night) under Waterloo Bridge by a gang of ‘rough elements’, a group of homeless women pursuing a petty feud. This truly is another London, and one that most of us will never have to discover. It is a bitterly cold night and as snowflakes fall , the bleak doorways that Mark once called home look especially uninviting. London can look like something from a fairy tale in the snow, but not this night. As we move into Theatreland, the tour develops the ebb and flow of performance art as comic vignettes – a singalong of ‘The Muffin Man’ on Drury Lane – are mixed with upsetting accounts of the vicious treatment the public can hand out to the homeless. Mark and Viv have harrowing stories of their time on the streets. 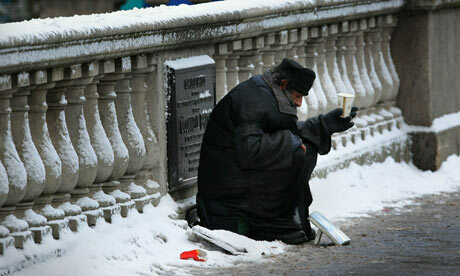 They talk of rough sleepers who have been spat on, robbed, punched and even set on fire by passers-by. ‘Somebody called me a tramp last week,’ says Mark, more indignant at this verbal slight than with the physical abuse he has received. Despite these dangers, this area between West End and City has always been popular with the homeless: the narrow streets are largely free of cars but receive plenty of pedestrians, often tourists on their way to the theatre, pockets jangling with change. Mark and Viv point out safe alleyways, often frequented by rough sleepers, that have been their former homes; or they take you to areas that the owners have rendered unusable for sleepers through the erection of barriers or removal of anything that may have acted as a shelter. The walk concludes at Lincoln’s Inn Field, a large green square in Holborn surrounded by imposing terraces. With a fresh fall of snow on the lawn, it’s a majestic sight but this was once a vast homeless campsite called Tent City. In the early 90s, the homeless were noisily evicted, part of an ongoing campaign against rough sleeping that Mark and Viv say is escalating, with long-running soup kitchens being banned by councils and rough sleepers forced to move from favoured spots in the West End out into the suburbs where they can be ignored. There is danger here – previously rough sleepers found safety in numbers, but now the forces of the state, as well as private security firms hired by companies to protect the public appearance of their premises, crack down on large groups of homeless people. 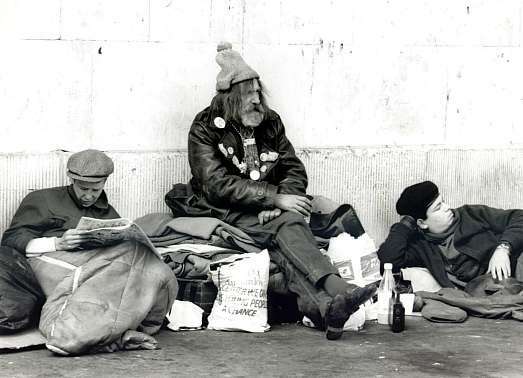 The number of homeless on London’s streets is rising, but that is harder to discern than it was in the 1980s, when there were huge homeless camps like Waterloo’s Bull Ring and Holborn’s Tent City. The state has sanitised the streets and tried to tidy the homeless away. They do not fit into the narrative of London as a great city of opportunity, reward and cash. But they still exist. The tour finishes on this disconcerting note, and Viv and Mark depart for their hostels in a flurry of kisses, handshakes and farewells and I wander off into the snow, back to my warm home and family. London will never seem quite the same again. There are Unseen Tours in Camden, London Bridge, Covent Garden, Shoreditch and Brick Lane. For more information and to book tickets, see here. It seemed like a good idea at the time. It was the mid-1980s, the economy was booming and Docklands was on the up. Tobacco Dock, an old Grade I-listed warehouse off East Smithfield in Wapping, seemed ripe for redevelopment. Rupert Murdoch had just moved New International next door from Fleet Street, and other companies were sure to follow. What better place to build the new Covent Garden, a lively hub of shops, bars and restaurants, where City fatcats and Wapping yuppies could mingle and spend? 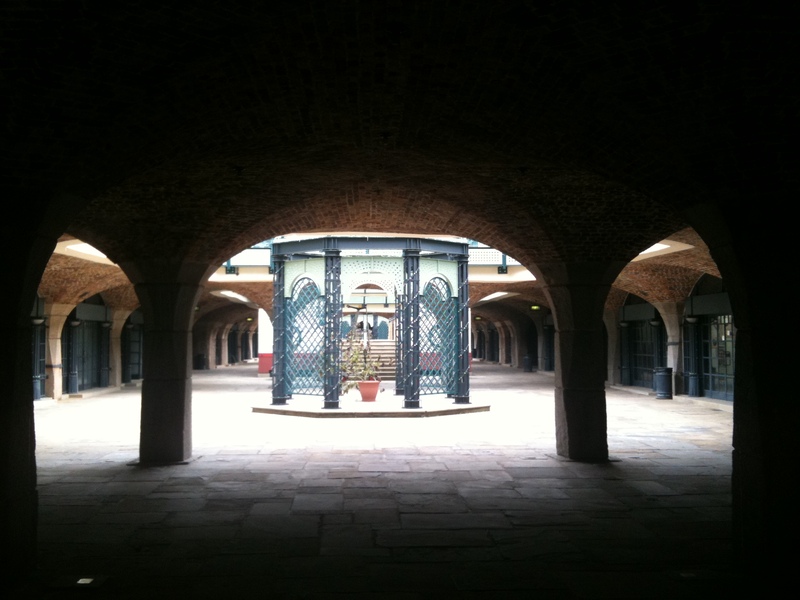 Terry Farrell did the architecture and Tobacco Dock opened in 1989, an elegant conversion that featured two arcades of shops on two floors inside a skilfully modernised structure that retained its Victorian industrial integrity. A canal provided a classy terrace for restaurants and bars, while the shops were the best of the era: Saab City, Next, Body Shop, Cobra and Monsoon as well as Justfacts, a shop selling accessories for your Filofax, and Uneasy, a shop that sold designer chairs. Think Broadgate Circus. Think Leadenhall Market. Think Hay’s Galleria. Here was the future. What could possibly go wrong? Even before Tobacco Dock opened, the UK economy was in recession and one-by-one, the new shops started to disappear. No new companies followed News International, and with poor transport links and a tanking economy, the yuppie money from Wapping’s riverside apartments could not keep the shops alive. 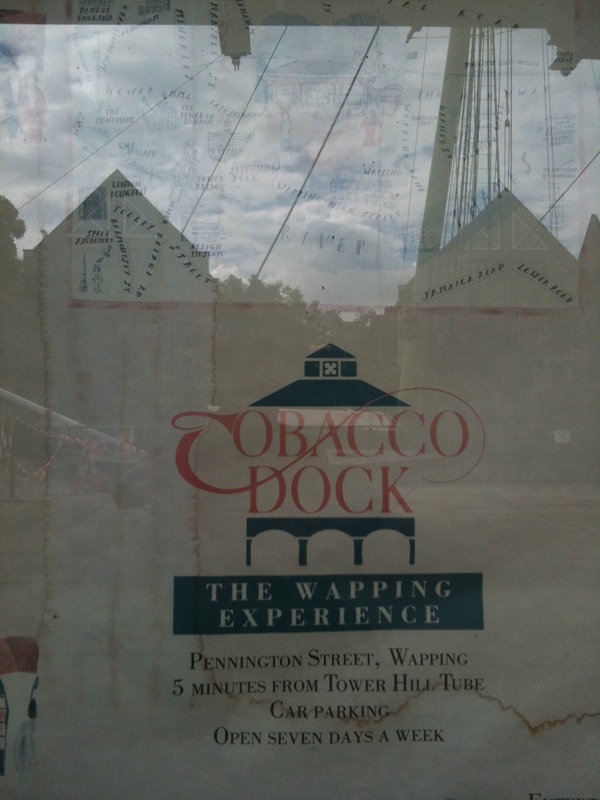 By 1995, Tobacco Dock was already a shell, with just two trading outlets, a restaurant called Henry’s and a sandwich bar, both kept afloat by Murdoch’s minions, of which I was one. Ten years later, just the sandwich bar remained; now that too is gone. 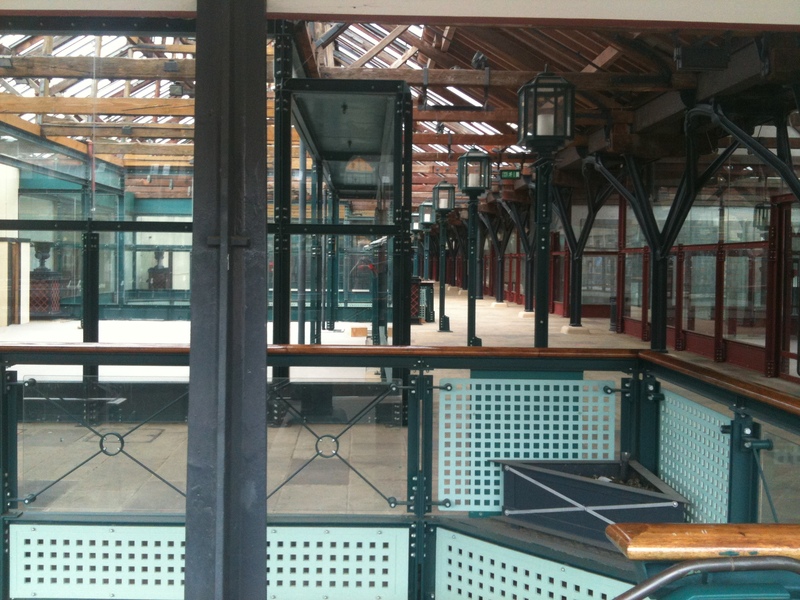 Tobacco Dock is completely empty, a ghost shopping centre forever frozen in 1989, when the world was at its feet. Come here, and you can smell the late-80s ambition and the disappointment and failure when it all started to unwind. It’s like the backdrop to a George Romero zombie film, or a metaphor for rampant commercialism wrapped in the setting of a failed shopping centre. Bizarrely, the empty centre remains impeccably maintained and open to the public. I spent happy hours in Henry’s when I worked at The Sunday Times in the 1990s and remember even then how strange it felt to march through the vacant complex, serenaded by mood music piped through the PA. When I returned a couple of years ago in search of nostalgia, there was only silence, broken by the sound of my footsteps echoing round the empty chamber, but the floors were still as clean and the fixtures and fittings as freshly painted as when it first opened. Rows of disused shops lined the central avenue like glass coffins, some still bearing the names of the shops that once operated here. Frank And Stein’s, the sandwich shop that held out longest like a Japanese soldier still fighting the Second World War twenty years after it ended, kept its sign and counter but the door was shackled by a heavy chain. 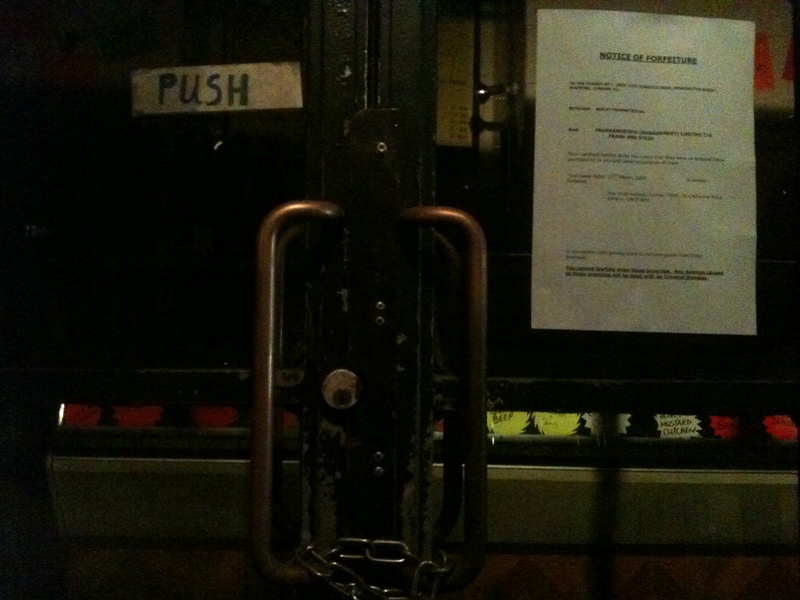 The eviction notice posted in the window a public sign of private tragedy. At the back of Tobacco Dock is a pretty canal, featuring a couple of tall ships that were intended for kids to clamber on while their parents ate at nearby restaurants. One such restaurant, an American diner called Peppermint Park, looked recently abandoned but had been empty for years. The week’s specials were still chalked up on the blackboard, but the interior was barren, holes in the wall indicating that these surfaces were once covered by a mass of Americana memorabilia which now probably line the walls of the nearest branch of TGI Fridays. 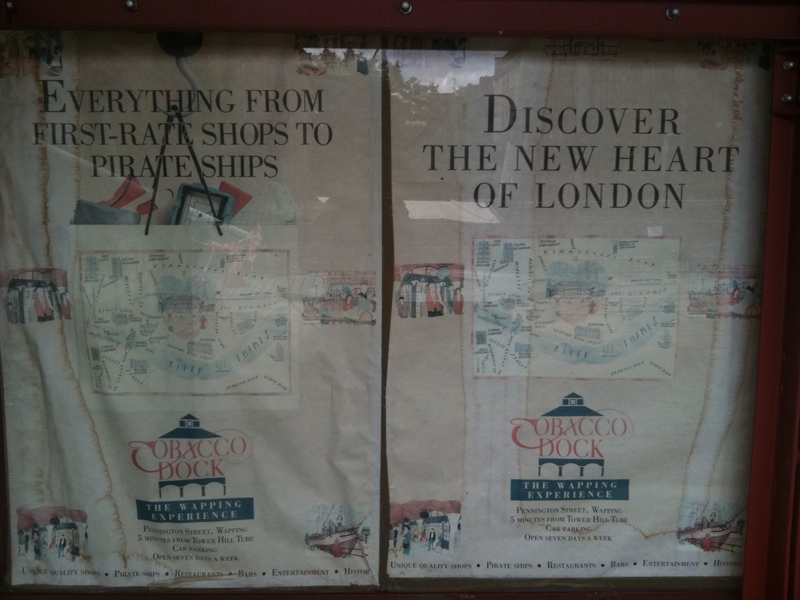 Here too were three faded posters, celebrating ‘Tobacco Dock – The New Heart Of London’, instantly evoking the lost mood of optimism. One of the posters was illustrated by a map, which in a cartographical display of wishful thinking, placed Tobacco Dock squarely in the centre of a buzzing quarter surrounded by the Design Museum, St Katharines Dock, Petticoat Lane and just off-scene, suggested by a tantalising arrow, the myriad delights of Greenwich. Along the bottom of each poster runs a legend, a promise of what lay within: ‘Unique quality shops – Pirate ships – Restaurants – Bars – Entertainments – History’. Well, it’s certainly history. One out of six ain’t bad. 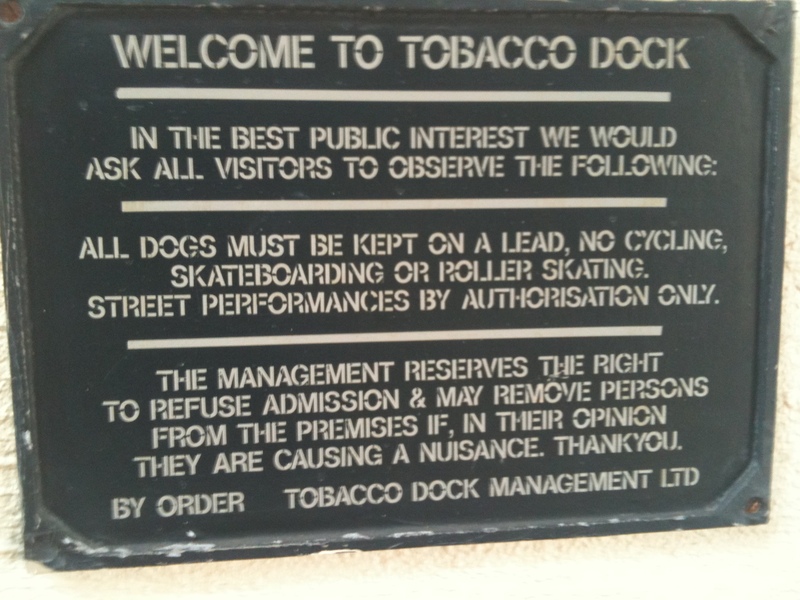 Footnote: I wrote this piece in 2010, since which time Tobacco Dock has started to open for occasional private events. I wrote this article in 2011 for Gulf Life about London’s super-prime property market. They call it super-prime. That’s the end of the London property market that starts at £15 million and goes as high as £150 million. It’s a market that operates in isolation from the rest of London and it’s one that is dominated by an international clientele, with buyers jetting in from the booming economies of the Far East, Russia and the Middle East. So what do they get for their bucks? ‘Buyers at this end of the market all have five demands,’ says Giles Hannah, who oversees the European operation of Christie’s Great Estates, the property branch of the venerable auction house, ‘security, space, parking, location and luxury features.’ Christie’s is currently selling a mansion on Cornwall Terrace, a dramatic John Nash-designed sweeping terrace overlooking Regent’s Park. It boasts six bedrooms, a home cinema, gym, steam room, study, state-of-the-art kitchen, mews house for staff, garage with blast-proof doors and majestic views of a royal park. Floors are covered by Italian marble, dark oak or silk carpet, there’s a chill room for furs and the walls are covered with paintings by Picasso and Damien Hirst on loan from the auction house. It’s yours for around £30 million. The address they all want is Knightsbridge, which partly explains the prices fetched at One Hyde Park, a development by Christian and Nick Candy. One Hyde Park is a gleaming Richard Rogers-designed tower of luxury that sits almost above Knightsbridge tube, with Hyde Park on one side and Harvey Nichols on the other. A penthouse is said to have sold for more than £100 million and, according to Savills, the selling agent, 60 per cent of the 86 apartments have been snapped up. 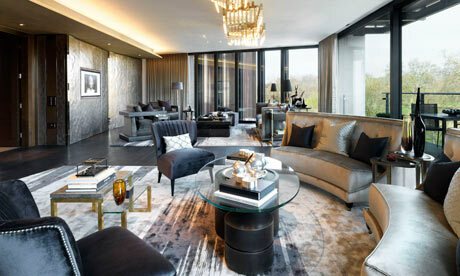 A five-bedroom apartment costs upwards of £50m and takes up an entire floor – around 10,000 square feet. The hallway stretches the length of the flat from master bedroom to reception room, one end overlooking the park, the other Knightsbridge. To give an idea of the scale, a baby grand piano in the corner of the living room looks like a coffee table. Off the corridor are a further four bedrooms, two reception rooms, a TV room, study, dining room and two kitchens (one for staff). The building contains a squash court, 22-metre pool, games room, party room and meeting room. The house, refurbished in 2008, was recently rented by a Lebanese family (another renter was Bill Gates), but is now on the market for just under £20 million. The selling point is the vast two-floor pre-war extension taking up the entire back garden, itself the size of a normal house. This holds the reception room and master bedroom. The five-bedroom house also has a sub-basement beneath the lower-ground-floor kitchen, containing a gym and steam room. There are, according to Hannah, only three developments ready for the super-prime market: Cornwall Terrace, One Hyde Park and The Lancasters. The latter is a fascinating project on the north side of Hyde Park in Bayswater. A regal Victorian terrace has been transformed. The old building behind the gorgeous Grade II-listed facade has been knocked down and replaced by an impressive new complex of 77 apartments, retaining the original front with its huge windows and exceptional views of Hyde Park. The surprising thing about all four properties is how similar they are. All are decorated in dark masculine colours. All have Gaggenau kitchens and Crestron systems to control sound, security and lighting. None have gardens. All have flat-screen TVs in the walls of every room. The houses have lifts – ‘Middle Eastern clients don’t like using the stairs,’ says Hannah – while the apartments encourage ‘lateral’ living. There are separate bedrooms and entrances for staff–at The Lancasters and One Hyde Park, some clients also purchase a separate apartment for staff. All have serious security, and all have space. Lots of space. The most breathtaking is One Hyde Park, the best views are from The Lancasters and Cornwall Terrace and the most charming is Ovington Square. Cherry agrees. ‘The market at this level is strengthening. Because people want certain key locations, the market can never be saturated, there are listings, conservation areas, it takes ages to get planning permissions and there are strict limits on tall buildings – it’s a very good market to be in.’ If you can afford it, obviously. This isn’t really a surprise. Successive TO editors have always struggled with the listings part of their brief: listings are ugly, boring and largely resistant to any sexing up, despite the best attempts of periodic and largely futile ‘redesigns’ (has a redesign of any magazine or newspaper EVER raised circulation?). They are also beyond the control of the editor, who has to leave them to section heads. Even editors who came from within the magazine, and therefore understood the centrality of listings to what Time Out did, didn’t actually appear to like them all that much. They take up valuable space from the exciting things an editor likes to do at the front of the mag and telling a section editor you are cutting their pages is a draaaag. To make matters worse, listings do not do well when it comes to ‘page views’ or ‘unique users’, the trite and often completely useless method by which the value of anything in print is these days judged. And because people don’t click on listings on the website (for reasons that are so obvious I won’t even bother to explain), the logic goes, they don’t read them in print. A number of people have noted that without decent browsable printed listings, Time Out has potentially rendered itself useless, but I don’t want to comment on that. What does interest me is that effect a lack of listings will have London’s smaller venues. The joy of TO‘s listings was that it gave the smallest museum or club as much prominence as the biggest and most well-funded, allowing readers to decide which to visit entirely on the merit of their programming. It’s this that made Time Out absolutely central to the rise of fringe theatre, avant-garde art, clubbing, burlesque and alternative comedy – each scene was created by individuals, but a free listing in Time Out coupled with enthusiastic support from in-the-know section editors took things to another level. Even larger venues have told me they noticed the difference in footfall when they were omitted from listings (by accident or for reasons of space). Time Out obviously doesn’t have the circulation, and therefore the pull, it once did and there are other specialist resources for those interested in the esoteric fringes of London’s cultural life, but the loss of listings will surely still be felt by venues that aren’t internet savvy or lack a large marketing department. The solution for many will be a prominent place in the preview part of the existing sections. 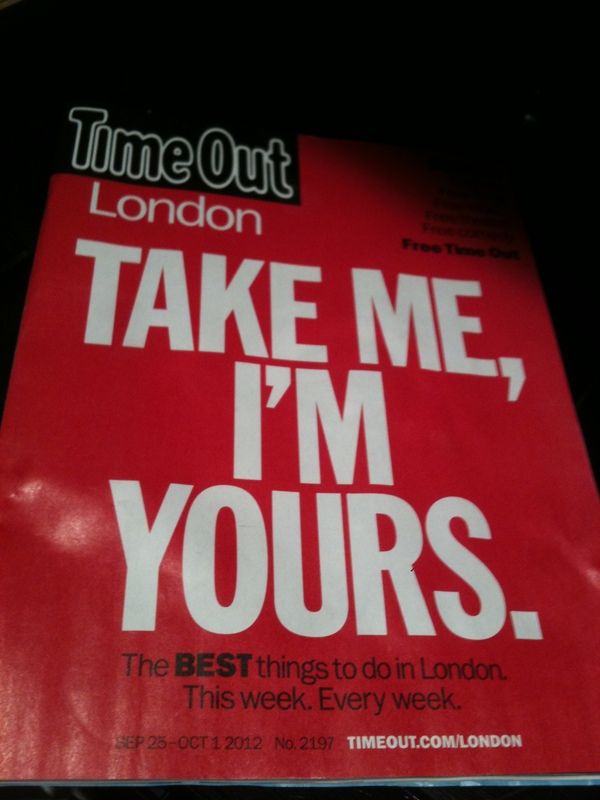 Time Out‘s section heads will never have been in such demand… And PRs can be a dangerously homogenising bunch. For more on the new Time Out, here’s Diamond Geezer (positive), Christopher Fowler (not) and Londonist (neutral). My review of Marf: City Blues, an exhibition at the Guildhall Art Gallery, appears in the Independent. The Guildhall in the City is an appropriate venue for a series of cartoons about the financial crisis of 2008 and its aftermath. Marf is Canadian, but her cartoons are all set in London, and the Gherkin, St Paul’s and the tube all make appearances. The exhibition is on until June 20. The Guildhall has recently become a free venue, which is slightly contrary to current trends, but the City of London has always done things a bit differently. It has a wonderful collection of London-related paintings, and is definitely worth a visit, and there are also plans to host regular paid-for temporary exhibitions. Marf, however, is free. The intention is that local workers, who are overwhelmingly from the financial services, will come to the gallery in their lunchtime to nose around. 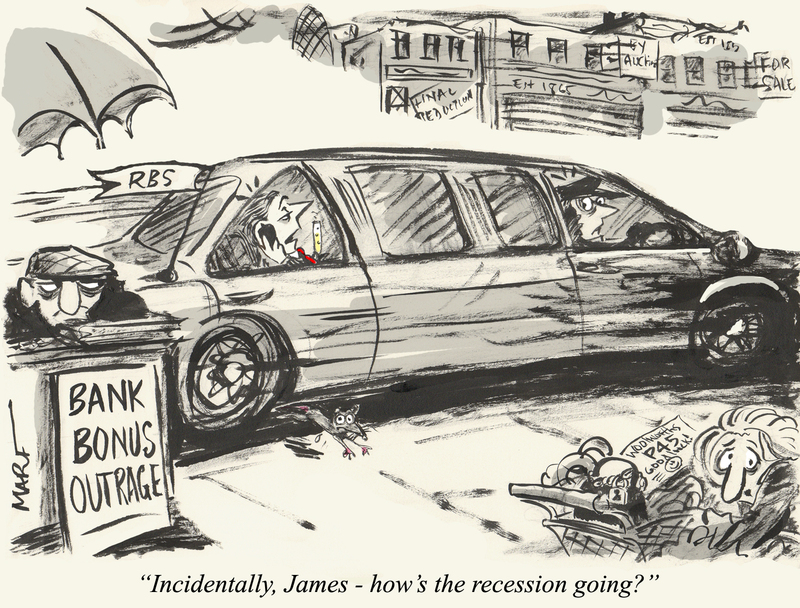 I wonder what they will make of cartoons like the following when they do? Water off a duck’s back, probably. When I first clocked a recession was imminent – after I’d checked the relevant terms of my contract and cancelled the statue of myself in solid gold I was having made for the front garden – I began to think about the opportunities that a recession can create. It’s now well established that many business start up during a downturn, largely because lots of people are out of work and have nothing better to do than be a bit imaginative. This time round, with the recession taking such a toll on incredibly wealthy financiers and bankers, who earned far more money during the Great Moderation than they could ever spend no matter how much they ballsed up house prices trying, I was convinced some fascinating new businesses would emerge. And so it has proved. A while back, a man called Ajit Chambers got in touch with me to promote his bold plan to open up London’s disused Tube stations to the public. He is still ruthlessly pursuing his vision and will, I believe, realise it, sooner rather than later. For more, watch this space. At around the same time I heard from a friend, Marisa Leaf, who has set up a company called Hubbub that takes orders from customers for posh delis around Islington (of which there are many) and delivers them all in one go to your door. I wrote about it in 2008 and on Tuesday, she was interviewed in the Evening Standard. In that piece she mentioned in passing one of the people whose food she sells, a banker from Highbury who jacked it all in to become a fisherman on the south coast. I interviewed him yonks ago, and the piece is due to run in Time Out sometime before I die, or so I have been promised. So that’s three stories that have come to me without me even looking, as all the best stories should. Where am I going with this? Well, I am in a decent position to start up a business of my own, being all of a sudden time, if not cash, rich and finding freelance journalism a potential struggle given that I’m not descended from anybody famous, daringly tedious/controversial or Stephen Armstrong. But there is a problem: I am suffocatingly risk-averse. And I am quite lazy. However, I do have one idea that I would love to take forward if somebody else is prepared to do the taking forward bit for me. It’s a crisp shop. A shop dedicated to selling not just any crisps, but the most interesting crisps – or other potato-based snacks – from around the world. These would be crisps of the rarest and most unusual flavours, the best packaged, golden oldies, with lots from Japan, where I do not know for sure but am pretty certain they make some of the most incredible crisps known to the crisp-world, in wonderful flavours and colours, and all with pictures of schoolgirls on the cover. This shop would be in south London, probably Streatham, and look like one of those trainer shops where people buy lurid and expensive footwear that they never intend to wear. It will be a design classic, floor-to-ceiling cellophane. Whenever Jay-Z comes to London, he will make my crisp shop one of his first ports of call, because I am sure Jay-Z loves crisps. The irony of this is that I do not particularly like crisps. Or Jay-Z for that matter. But this only adds to the beauty of the concept. If you like it, I will next tell you about my plan for a restaurant that only serves starters and desserts, because main courses are, and we really should be prepared to admit it by now, invariably a crushing disappointment.